BRED Banque Populaire is one of the first commercial bank within BPCE Group (2nd largest banking network in France). BRED IT (Thailand) ltd, a subsidiary of BRED Banque Populaire, has been founded in 2010 and counts more than 100 employees. BRED IT (Thailand) acts as an IT Hub for the group, serving International subsidiaries in Asia, Pacific and Africa. We are looking for a Business Intelligence (BI) Analyst to participate to the design & implementation of BI solutions for a multi-site worldwide french banking group. · Be able to convert a business requirement into a systems solution using key analytical skills. · Participate to the implementation and the day to day support of the data collection and storage systems. · Design systems in order to address decisional and analytical needs from BU. · Standardize and Streamline BI process and solutions. · Documentation of source-to-target mappings, data dictionaries, and database design. · Participate to Business Intelligence projects in an international context (bank’s subsidiaries across the world – France, Asia, Pacific, Africa). · University Master degree in IT. · 3 years in a similar IT position. · Good level in English (writing and speaking). · Expert in Data modeling. · Strong skills in PL/SQL and Oracle Database and BI solutions (OBIEE,…). · Expert in datamart modeling and extraction processes (Datastage, ...). · Good skills in data visualization tools (QlikView, Tableau,…). · Good knowledge of Business Intelligence solutions architecture. · Good knowledge and understanding of the key Financial & Banking concepts. · Experience with Flexcube core-banking system (Oracle). · Knowledge of Microsoft BI Technologies (SQL Server, SSRS, SSIS, SSAS, PowerBI). · Be familiar with Data mining concepts. 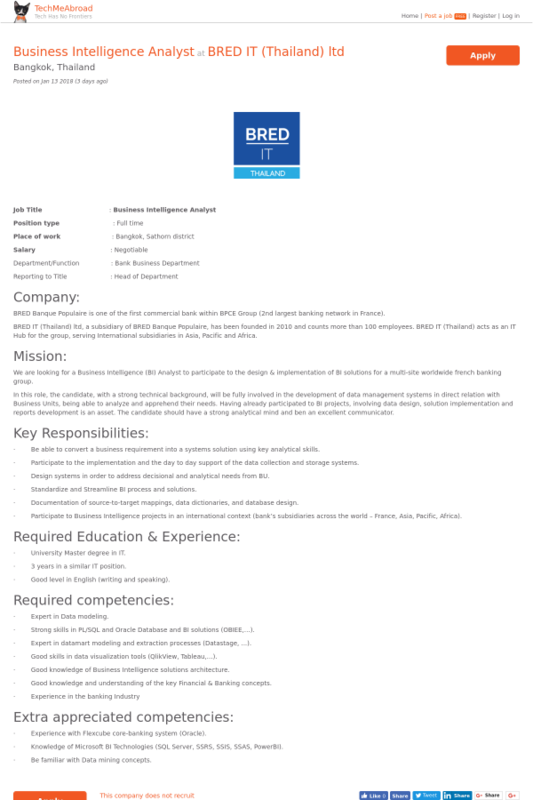 Do you have any question or comment for BRED IT (Thailand) ltd about their position Business Intelligence Analyst ? Get noticed by being the first to ask BRED IT (Thailand) ltd a question.